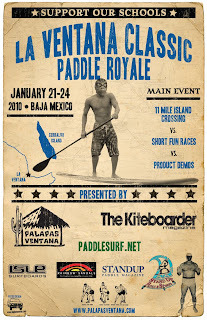 Stand Up Paddle Surfing: Paddle Royale in La Ventana: Register Here! Don't miss this one! There's none other like it. Called the Paddle Royale, the featured race is a first ever "Crossing". This race is an invite-only 11 mile run from Cerralvo Island to La Ventana. The Crossing will feature a cash prize for the winner. There will also be 1 and 2 mile races featuring both Stock and Unlimited classes that are open to all. The "fun race" will be a stand up paddle relay race. Interested? Click here for registration information. THE CROSSING – an 11 mile invite invite race for advance paddlers – Pangas take competitors over to Cerralvo Island in the early morning and they paddle downwind back to the La Ventana shores and the cheering crowd. Competitors will ride stock 12’6” and under boards.